The bitcoin crackdown is getting serious. 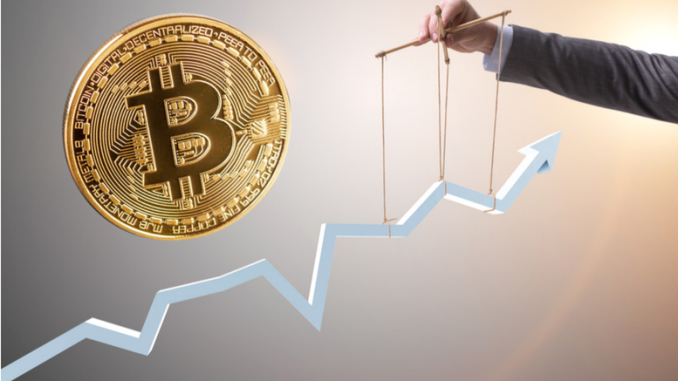 The Justice Department has launched a criminal probe into traders that have been manipulating the price of bitcoin and other cryptocurrencies, causing wild fluctuations in price without any reason, according to reports. The DOJ, along with the Commodity Futures Trading Commission, are investigating whether traders have been making orders without any intention of filling them — a practice known as spoofing — or selling the cryptocurrencies to themselves as ways to manipulate the price of the digital monies. The investigation, first reported by Bloomberg on Thursday, marks an acceleration of regulators and law enforcement cracking down on the use of the white-hot digital investments. “It’s public knowledge that these things happen, there’s no oversight of the market,” Marc van der Chijs, a long-time crypto investor and founder of First Block Capital, told The Post. “Most exchanges aren’t very liquid. With $10- to $15 million you’re able to move markets quite substantially,” he added. The news initially sent the price of bitcoin down more than 2 percent, but it rose 1.3 percent, to $7,599.23 by early afternoon. Last year, bitcoin saw its value explode to nearly $20,000 from about $1,000 the year before as investors were lured in by the futuristic promises of the industry and, above all, greed. Bitcoin has collapsed more than 50 percent, but true believers have continued to flock to digital currencies — and last week Ethereum’s co-founder held a $3 million blow-out party for revellers. Bitcoin, Ethereum and other similar cryptocurrencies have been plagued with reputations for aiding drug dealers and money launderers since transactions are conducted anonymously and are extremely difficult to track. About $1.2 billion in cryptocurrency has been stolen by criminals, many of which are associated with drugs or money laundering — and only about 20 percent of that has been recovered, according to a study released Thursday by the Anti-Phishing Working Group, a cybersecurity non-profit. In April, then-New York Attorney General Eric Schneiderman sent letters to 13 cryptocurrency exchanges asking for information about their general practices, including how they police fraud, money laundering, and other illegal operations. That market, which uses similar technology to the bitcoin, has been over-run with scams and get-rich quick schemers. Last month, advisory firm Satis Group released a research report that found that 80 percent of ICOs are scams.